One of the founders of Viplava Rachayitala Sangham (Virasam-revolutionary writers association) Chalasani Prasad passed away at his residence at HB Colony, Seetammadhara in Visakhapatnam around 11.30 a.m. on Saturday. He was 83 and is survived by two daughters. Prasad's wife passed away a few years ago. He had suffered a heart attack and breathed his last before an ambulance reached his home. Chalasani Prasad was born in a communist family at Bhatlapenumarru in Krishna district and lived all through his life as a Marxist. 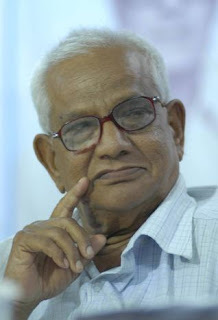 He was detained during the Emergency and was arrested several times later due to his Marxist ideology and pronouncements and because ‘Virasam’ is considered as a front organisation of the CPI(Maoist). Prasad retired as a lecturer of Politics at Mrs. A.V.N. College in Visakhapatnam. As a teacher, he had endeared himself to the students and was also keen to improve their personality. He was very close to Sri Sri, Raavi Sastry, Ranganayakamma and several others. He might be a Leftist, but he would not miss a literary meeting on Viswanadha Satyanarayana, because he appreciated his writings.